“Saginaw” redirects here. For other uses, see Saginaw (disambiguation). Downtown Saginaw in April 2008, as seen from the Bearinger Building. Saginaw /ˈsæɡ.ɪ.nɔː/ is a city in the U.S. state of Michigan and the seat of Saginaw County. Both the city of Saginaw and Saginaw County are located in the Flint/Tri-Cities region of Michigan. The city of Saginaw is located adjacent to Saginaw Charter Township and is considered part of the Tri-Cities area, along with neighboring Bay City and Midland. The name Saginaw is widely believed to mean "where the Sauk were" in the Ojibwe language, possibly in reference to the Sauk tribe who lived at the mouth of the river. Another possible explanation is that it originated from "Sace-nong" or "Sak-e-nong" (English: Sauk Town) because the Sauk people once lived there, or from Chippewa words meaning 'place of the outlet' from "sag" (English: opening), and "ong" (English: place of). However, this name may be a mistake. When Natives told Samuel de Champlain that the Sauk nation was located on the west shore of Lake Michigan, Champlain mistakenly placed them on the western shore of Lake Huron. This mistake was copied on subsequent maps, and future references identified this as the place of the Sauks. The site of what later became the city of Saginaw was originally inhabited by the Sauk people, who lived in the area and were driven out by the Ojibwe (Chippewa). French missionaries and traders first appeared in the area during the late 17th century. The first permanent settlement by those other than Native Americans was in 1815 when Louis Campau established a trading post on the west bank of the Saginaw River. Shortly thereafter the United States established Fort Saginaw. Campau's trading post was also inhabited by Metis. During Michigan's territorial period, a county and township government were organized at Saginaw. Growth of the settlement was fueled rapidly during the 19th century by the lumber industry. Saginaw was the site of numerous sawmills and served as a port for Great Lakes vessels. What is now the city of Saginaw resulted from the consolidation of the cities of East Saginaw and Saginaw City (West Side) in 1889. In 1819, Lewis Cass, in the Treaty of Saginaw, negotiated the prerogative for the United States to own and settle the area with the leaders of the Ojibwe. Soon thereafter the United States Army established a fort on the west bank of the Saginaw River and named it Fort Saginaw. Due to the undesirable conditions of intense humidity and mosquito infestation, Fort Saginaw was abandoned by 1824. A group of investors purchased some land near the fort and had it platted under the name, Town of Sagana. By the late 1820s the American Fur Company was operating a post at Saginaw. Few plots were sold and after the U.S. Army pulled out, the town languished for most of the following decade. The town was re-platted in December 1830, comprising riverfront from Cass Street, on the south, to Harrison Street, and north to Jefferson. These plots sold slowly. By 1835, only 24 plots had been sold and the remainder were transferred to a new owner, who made another plat in February 1837. However, the financial crisis of the Panic of 1837 dampened interest in purchasing properties. After selling only 58 out of the 407 plots, the remainder was sold again in 1841. Saginaw was the location of the annual government payment to the Ojibwe and Ottawa of the area, starting in the 1830s. This also attracted many French-Canadian and Euro-American merchants, primary involved in selling watered down whiskey. The main cause for the founding and subsequent development of Saginaw was the large demand for lumber as the United States expanded westward. A virgin growth forest principally consisting of white pine trees covered most of Michigan. The convenient access to transportation provided by the Saginaw River and its numerous tributaries fueled a massive expansion in population and economic activity. As the trees were being cut down in the region, logs were floated down the rivers to sawmills located in Saginaw, destined to be loaded onto ships and later railroad cars. Multiple settlements comprise present-day Saginaw. On the west side of the river the first settlement around what had been Fort Saginaw developed into Saginaw, which was incorporated as a city in 1857, containing the seat of the Saginaw County government. On the east side of the river a parallel settlement, East Saginaw, developed which was incorporated first as a village in 1855, and then as a city in 1859. Also south of East Saginaw, on the east bank of the river, the village of Salina formed. Salina's name relates to the salty brine that led to a growing industry of salt production in the area. Both Saginaw and East Saginaw quickly became a hub for railroad transportation in addition to ships making their way on the Saginaw River. By the early 1870s, lumber production peaked, but had virtually disappeared by the end of the 19th century. In addition to salt production, which experienced an eventual decline as well, growing industries, such as those supporting the area's agriculture and manufacturing, developed. On June 28, 1889, the Michigan state legislature passed Act 455 to consolidate the cities of Saginaw and East Saginaw into a single city. Prior to this consolidation, the nearby village of Salina had already become part of East Saginaw. The consolidation of Saginaw became effective with the election of officers on March 12, 1890. The Hoyt Public Library, pictured here in June 2006, was built in 1887 by Van Brunt & Howe of Boston. The provisions of the city charter were established by the same act of the legislature that provided for the consolidation. Saginaw was to be governed by a city council consisting of two aldermen elected from 21 wards and a mainly ceremonial executive mayor who was to have fairly weak powers. This was to be, as numerous other elected officials, along with elected or appointed boards, controlled much of the administrative and executive functions of government. The efficient and cohesive functioning of the Saginaw city government also was constrained by remaining rivalries between residents, business owners, and politicians from the former two cities. The distinctions and rivalries between Saginaw's east side and west side persisted into the 20th century in various forms, and continues to influence Saginaw's social, political, economic landscape, even into the 2010s. Around the start of the 20th century, the automobile production proliferated throughout Michigan, but most notably in Detroit. Other Michigan cities developed roles as suppliers to Detroit factories, sometimes with factories of their own. In Saginaw, the Jackson-Church-Wilcox Company began as a partnership in 1906 for producing a steering gear under the "Jacox" brand. Jackson-Church-Wilcox was acquired by Buick in 1909, and as part of General Motors would become the Jackson, Church and Wilcox Division, the first GM division specifically devoted to parts production; In 1919 the Jacox division would be organized with Saginaw Malleable Iron and Central Foundry into GM's Saginaw Products Company, and would form the basis for the Saginaw Steering Gear Division, created in 1928. General Motors and other manufacturers also established foundries and other automobile-related manufacturing facilities in Saginaw, for the production of chemicals and plate glass, as well as metal fabrication. This early development of a symbiotic relationship with the auto industry would set the course for the future economic circumstances of the city. In 1908, a new Michigan state constitution was adopted. The new Michigan state constitution mandated increased home rule powers for local units of government, and the Michigan state legislature enacted the Home Rule Cities Act in 1909. Under this statute, cities were permitted to frame and adopt their own city charters and were given great flexibility in structuring their local governments. The government, under the 1889 charter, had continued to be inefficient and provided for much political infighting. In 1913, a new city charter was adopted with voter approval and which followed a commission form of city government that had gained in popular interest among various cities across the United States in the early 20th century. The new government consisted of five commissioners, each elected separately at-large, who served both as the city council and as the executive heads of various city government departments. One of the commissioners served as the mayor, which was a mostly ceremonial role. The 1913 city charter was followed for little more than two decades when the voters of the city again adopted another new city charter in 1935 following the council-manager form of government. The government under the 1913 city charter retained some of the independent boards that were given authority independent of the elected city commissioners. This caused some inefficiency and political friction. The economic consequences of the Great Depression during the 1930s provided the final catalyst for municipal government reform. In contrast to the previous government structures, the 1935 charter, having taken effect in 1936, provided for all administration of city government to be headed directly by a single officer, the city manager, who was appointed by, and accountable to a city council of nine members elected as a group by the entire city at-large. The system was designed to address two principal issues with Saginaw's history of municipal government, the inefficiency and politics associated with having executive and administrative authority spread among many different officers and boards, and political rivalries and friction between various geographic areas of the city, mainly the east side and the west side. The former East Saginaw Post Office, pictured here in June 2006, is now is the site of the Castle Museum of Saginaw County History and is also listed on the National Register of Historic Places. During much of the 20th century, Saginaw's economy was dominated by manufacturing related to the automotive industry; most notably, manual transmission assemblies, steering gear boxes and power steering pumps. At the height of manufacturing in the 1960s and 1970s, the city and neighboring Buena Vista Township hosted 12 General Motors plants, an Eaton Manufacturing plant where 5,000 people turned out auto parts (demolished 2008), and numerous smaller concerns. The original Jackson-Wilcox factory on Saginaw's North Hamilton (ca. 1906), later Saginaw Steering Gear Plant 1, closed 1984, sold by GM in 1987 to Thomson Industries, still operating as of 2009. Chevrolet Saginaw Parts at Sixth and Washington on Saginaw's East Side, built in 1906 as the assembly plant of the Rainier Motor Car Company, acquired by GM in 1907; closed 1983 and demolished 1984. Saginaw Malleable Iron on the Southwest Side (1917); contracted to build gear housings for GM's Jacox division (the former Jackson Wilcox company, later Saginaw Steering Gear), sold to GM in 1919, later part of Saginaw Products Division, reorganized into a new Central Foundry Division in 1946. Closed May 2007, razed in 2010 and for sale as of May 2013 by the RACER Trust, charged with disposing of abandoned GM properties. Chevrolet Grey Iron, on the North Side of Saginaw, opened as Central Foundry in 1918, operated by Chevrolet Division 1927-1983, thereafter by GM Powertrain Division; still operating today as Saginaw Metal Casting Operations, the only GM manufacturing division still operating in Saginaw County. Saginaw Steering Gear Plant 2, the "Gun Plant" (see below) adjacent to Malleable Iron; opened March 1941, closed July 2001, razed 2002. For sale by RACER Trust as of May 2013. The 400-acre Saginaw Steering Gear complex in Buena Vista Township; Plant 3 opened 1953 next to the then-new US-23 bypass, adding Plants 4, 5 and 6 by 1966 and a seventh shortly thereafter. Later known as Saginaw Division, then part of Delphi, sold in 2010 to Nexteer Corporation, is supplying GM, Ford and Chrysler as of 2013. Chevrolet Nodular Iron in Buena Vista Township, built 1964-1965, entered production 1967, announced for closure 1986, closed 1988; since demolished. Property for sale by RACER Trust as of May 2013. Even before the United States entered World War II on the side of the Allies, Saginaw's industrial complex became directed towards military production. Turning its efforts to the production of munitions, ordnance and components for military vehicles made Saginaw a significant contributor to the Allies' eventual victory. Perhaps most famously, Saginaw was home to a production facility that produced .30 caliber machine guns far more quickly and for far less than the Army thought possible, armor-piercing shells for anti-tank use, and over half a million M1 Carbine rifles for the U.S. military during World War II, the "Gun Plant" that later became Steering Gear Plant 2. Saginaw Steering Gear's Plant 1 also began wartime production in 1941, concentrating on ball screws that would eventually be used in the wing flaps of the Boeing B-29 Superfortress. Malleable Iron converted its production of Armasteel from engine components to gun parts and tank treads, while Grey Iron specialized in the production of magnesium for use in Pratt and Whitney aeroplane engines. Migration from across the country, particularly from the Southern United States, drastically increased Saginaw's population during the war years and through the 1950s. This population growth included the expanded presence of African Americans and Latinos in Saginaw. Even before the end of the war, the needs of Saginaw's growth became clear, and were met by significant investment in the city's infrastructure. In 1947, Saginaw and the nearby city of Midland constructed a 65-mile long water supply pipeline drawing water from Whitestone Point in Lake Huron to meet the anticipated needs of the communities. In addition, the cities of Midland and Bay City joined with Saginaw to develop and operate an airport on the site of a former POW camp in nearby Tittabawassee Township, which eventually became MBS International Airport. In the years following World War II, the Michigan state legislature enacted laws making it increasingly difficult for incorporated cities to expand by annexing territory from neighboring townships. Townships, which had historically served an agrarian, smaller population than that of the larger cities, were given the ability to provide nearly all of the same services that an incorporated city could. Although Midland pursued (and continues) to pursue a policy of "No annexation, no water," Saginaw chose instead to sell water to neighboring communities under long-term contracts. This allowed the townships to further develop at the expense of the city, the limits of which changed little after consolidation in 1889-90. The unintended consequence of this choice was that the city of Saginaw stopped growing in population, new housing development focused on the suburban townships, and eventually, businesses would follow. The site of the abandoned Flint & Pere Marquette Union Station, as it appeared in November 2008. The manufacturing presence in Saginaw declined in the latter half of the 20th century, leading to high unemployment throughout the city. As a result, the city's population diminished; from 2000 to 2010, the population of Saginaw proper had decreased by nearly ten thousand people, and Michigan's state population during that time period decreased by 0.6% percent, the only U.S. state to lose its population during the 2000s (decade). In addition, Saginaw has faced increasing social problems relating to poverty, as a result of its high rate of unemployment. In recent years, Saginaw's crime rate has been a major area of concern for the community as well. The economic conditions of Saginaw, compounded by the 2007–2012 global financial crisis, make up another significant area of concern for the city's residents. The decline of manufacturing jobs has resulted in high rates of unemployment. There has been a decline in property values in the city, which has decreased the amount of money the city government is able to collect through property taxes. Saginaw has experienced a significant increase of crime activity while at the same time being forced to decrease the size of its police department. The end result was that the number of city employees and the size and scope of city government decreased to nearly half of what it was during the 1970s, although the population has decreased at nearly the same rate comparatively. Unemployment and population loss in the late 20th and early 21st centuries has led to significant blight and a rise in abandoned homes in the city of Saginaw, providing locations for criminal activities such as arson, squatting, and drug deals to occur. In recent years, city officials, local law enforcement, and neighborhood watch associations have made progress in the prevention of these activities by heavily patrolling target areas and offering rewards for reporting illegal or suspicious activities. Efforts to reduce blight in Saginaw increased greatly in 2013, with the United States Department of the Treasury approving a federally-funded grant aimed at demolishing vacant and abandoned properties via the Michigan State Housing Development Authority. The $100 million grant contains $11.2 million set aside for Saginaw, with Detroit receiving $52.3 million, Flint receiving $20.1 million, Pontiac receiving $3.7 million, and the final $2.5 million going to Grand Rapids. In a press release, Michigan Governor Rick Snyder praised the initiative, saying, "With these federal funds, we'll be able to launch large-scale demolition programs that strike at the blight that is weakening too many neighborhoods in these cities." He added, "This aggressive anti-blight effort will help stabilize neighborhoods that have been struggling for years. As the abandoned properties come down, property values will go up, and crime will go down. That will encourage the people who live in these neighborhoods to stay in their homes and be part of the revitalization of their communities." The Saginaw city government can only legally tear down blighted properties that are publicly owned, a number that stands above 400. The federal grant provides funds to demolish nearly 950 structures. After the grant's approval, Saginaw city officials announced a program to purchase unwanted, abandoned structures from property owners, which would be then added to the list of homes to tear down. Officials estimate that there are nearly 1,200 privately-owned homes within the city limits that are worthy of demolition. Efforts to revitalize downtown increased in 2013 as well. CBS television executive and Saginaw native David Strouse announced an investment plan in late 2013 that would save nearly an entire block of buildings slated for demolition at the intersection of Washington and Genesee, the core of downtown Saginaw. The plan calls for the renovation and redevelopment of four buildings, creating market-rate apartments on the upper floors and retail space at ground level. In 2012, a similar deal was made in regards to the Bancroft and Eddy apartments, located at the same intersection. Once section-8 housing, these buildings will also be transformed into market-rate apartments and retail space. The Saginaw River freezes in the cold Michigan winter of February 2008. According to the U.S. Census Bureau, the city has a total area of 18.10 square miles (46.88 km2), of which, 17.34 square miles (44.91 km2) is land and 0.76 square miles (1.97 km2) is water. Saginaw lies on the Saginaw River, 15 miles (24 km) inland from the Saginaw Bay, an arm of Lake Huron. Saginaw is the largest principal city of the Saginaw-Bay City-Saginaw Township North CSA, a Combined Statistical Area that includes the Saginaw-Saginaw Township North (Saginaw County) and Bay City (Bay County) metropolitan areas, which had a combined population of 307,940 at the 2010 census. As of the census of 2010, there were 51,508 people, 19,799 households, and 12,252 families residing in the city. The population density was 2,970.5 inhabitants per square mile (1,146.9 /km2). There were 23,574 housing units at an average density of 1,359.5 per square mile (524.9 /km2). The racial makeup of the city was 43.5% White, 46.1% African American, 0.5% Native American, 0.3% Asian, 5.2% from other races, and 4.4% from two or more races. Hispanic or Latino of any race were 14.3% of the population. There were 19,799 households of which 36.0% had children under the age of 18 living with them, 26.9% were married couples living together, 28.7% had a female householder with no husband present, 6.3% had a male householder with no wife present, and 38.1% were non-families. 32.1% of all households were made up of individuals and 9.5% had someone living alone who was 65 years of age or older. The average household size was 2.52 and the average family size was 3.19. The median age in the city was 33.5 years. 28.4% of residents were under the age of 18; 10.6% were between the ages of 18 and 24; 25.1% were from 25 to 44; 25% were from 45 to 64; and 10.9% were 65 years of age or older. The gender makeup of the city was 47.1% male and 52.9% female. As of the census of 2000, there were 61,799 people, 23,182 households, and 15,114 families residing in the city. The population density was 3,542.9 people per square mile (1,368.2/km²). There were 25,639 housing units at an average density of 1,469.9 per square mile (567.6/km²). The racial makeup of the city was 47.02% White, 43.26% African American, 0.49% Native American, 0.33% Asian, 0.02% Pacific Islander, 5.86% from other races, and 3.03% from two or more races. Hispanic or Latino of any race were 11.75% of the population. There were 23,182 households out of which 35.4% had children under the age of 18 living with them, 32.9% were married couples living together, 27.3% had a female householder with no husband present, and 34.8% were non-families. 29.5% of all households were made up of individuals and 9.9% had someone living alone who was 65 years of age or older. The average household size was 2.60 and the average family size was 3.23. In the city the population was spread out with 31.6% under the age of 18, 9.9% from 18 to 24, 28.3% from 25 to 44, 18.7% from 45 to 64, and 11.4% who were 65 years of age or older. The median age was 31 years. For every 100 females there were 87.2 males. For every 100 females age 18 and over, there were 81.0 males. The median income for a household in the city was $26,485, and the median income for a family was $29,945. Males had a median income of $31,614 versus $22,714 for females. The per capita income for the city was $13,816. About 24.7% of families and 28.5% of the population were below the poverty line, including 40.2% of those under age 18 and 16.3% of those age 65 or over. Saginaw is classified as a Home Rule City under the Michigan Home Rule Cities Act which permits cities to exercise "Home Rule" powers, among which is the power to frame and adopt its own City Charter which serves as the fundamental law of the city, in a manner similar to a Constitution for a national or state government. The present Charter was adopted in 1935 and took effect on January 6, 1936. Pursuant to the City Charter, Saginaw is governed by a nine member elected at-large Council. The term of office for a member of the City Council is four years commencing with the first meeting following a regular municipal election. The terms of Council members are staggered so that the entire Council is not subject to re-election at the same time; alternatively either four or five members are elected in each odd-numbered year. Aleda E. Lutz Veterans Affairs Medical Center, located at 1500 Weiss, is a hospital serving America's Veterans overseen by the Veterans Health Administration. It has 100 staffed beds, and sees 292,000 patients a year. St. Mary's of Michigan, located at 800 South Washington, is a hospital with approximately 225 staffed beds, and sees 168,000 patients a year. Saginaw is served by Delta College and Saginaw Valley State University, which are located in nearby University Center, Michigan and a campus of Davenport University, located in Kochville Township. Central Michigan University maintains an off-campus center inside the city that offers numerous degree programs. The city of Saginaw is served by the Saginaw Public School District, also known as SPSD. The Saginaw Public School District operates twelve elementary schools, two combined elementary/middle schools, two middle schools, one combined middle/high school, and two high schools. The district is governed by a seven member elected board of education. The board selects a superintendent for the district. The current superintendent is Dr. Carlton Jenkins. The three public high schools in Saginaw are Arthur Hill High School, Saginaw High School, and the Saginaw Arts and Sciences Academy. Michigan Lutheran Seminary is the lone private high school in the city. Charter schools in the city are North Saginaw Charter Academy, Francis Reh Academy, Saginaw Prep schools, and the International Academy of Saginaw. The Fashion Square Mall in nearby Saginaw Township, Michigan, as it appeared in December 2010. The Saginaw metropolitan area's main shopping district is located in neighboring Saginaw Township along Bay Rd. and Tittabawassee Road north of town, where several big box stores and regional restaurant chains can be found. Also in the same area is Fashion Square Mall, a regional shopping mall anchored by JCPenney, Macy's, and Sears. Primary areas within the city of Saginaw for consumer shopping include Old Town and downtown. The City of Saginaw gets its electricity and natural gas from Consumers Energy. In 1929, the city opened its consolidated water works plant which replaced two separate plants that were on each side of the Saginaw river. This plant treated water brought in from the Saginaw river and piped it out to the residents as well as corner pumps for people that did not have direct connections to the system. Currently, the City of Saginaw jointly owns with the City of Midland the Saginaw-Midland Municipal Water Supply Corporation. Incorporated in 1946, this water treatment system has supplied drinking and industrial water to both cities and many surrounding areas within the county. Due to brackish water being in the aquifers below both cities, a 65-mile (105 km) long pipeline was constructed in 1948 to supply water from Lake Huron at White Stone Point, north of Au Gres to water treatment plants in Saginaw and Midland with a second pipe added by 1996. This system has played a role in the decline of the city. The City of Saginaw, in order to obtain new sources of revenue, sold water to areas outside of the city (especially to the Saginaw Charter Township). This caused numerous businesses inside the city to leave for the surrounding areas and development in the city to stagnate. The City of Midland, however, adopted a policy of "No Annexation, No Water" which has led to the growth of the city as well as the surrounding areas. Historically, ships were able to move all along the length of the river inside the city but fixed bridges being built over the river closed access south of the northern docks. Historically, Saginaw was a railroad hub to the Pere Marquette Railway. Freight and passenger routes radiated to Bay City to the north, Port Huron to the east, Toledo to the south, Grand Rapids and Chicago to the southwest and Ludington to the west. Most passenger routes were discontinued during the 1950s. Saginaw is served primarily by two airports: MBS International Airport, located in nearby Freeland, and Bishop International Airport, located in Flint. Saginaw is also served by three smaller airports: Harry W. Browne Airport in adjacent Buena Vista Township, James Clements Municipal Airport in Bay City, and Jack Barstow Municipal Airport in Midland. In addition to the airports, Interstate 75 serves as the main arterial route for the Saginaw area while Interstate 675 provides direct access to the center of the city from Interstate 75. Interstate 69 is a nearby east-west corridor providing access to the rest of the Midwestern United States and Canada. The Saginaw River runs through the middle of the city and provides access to Saginaw Bay and the rest of the Great Lakes via docks on the northern side of the city. In the city and surrounding areas, mass transit is provided by bus under the authority of the Saginaw Transit Authority Regional Services (STARS) system. The STARS system connects to Bay City's Bus system at Saginaw Valley State University. I-75 passes along the eastern side of the city through Buena Vista Charter Township. I-675 provides a short freeway loop through downtown Saginaw and back to I-75 through Saginaw Charter Township. M-46 is a cross-peninsular road, running across the mitten and the thumb − from Port Sanilac on the Lake Huron shore, through Saginaw, and then on to Muskegon on the Lake Michigan shore. This east-west surface route nearly bisects the Lower Peninsula of Michigan latitudinally. M-47 passes through the western suburbs and provides a direct connection to MBS International Airport. The site of a National Register of Historic Places-listed house at 1514 N Michigan, in Saginaw, as it appeared in July 2010. The Dow Event Center at nighttime, as it appeared in December 2004. Saginaw's main entertainment can be found in the downtown area, where places such as the Children's Zoo, The Dow Event Center and the restored Temple Theatre offer live entertainment. The Dow Event Center is also home to the city's junior ice hockey team, the Saginaw Spirit of the Ontario Hockey League as well as The Saginaw Sting, an indoor football team. The downtown Saginaw area, which contains a number of office buildings from the late 19th century and early 20th century, is located near the Saginaw Club, a local businessmen's club founded in 1889, and the Saginaw Center, an educational complex run by Delta College. Once vibrant, the downtown area has been in decline in recent years and presently struggles with blight. Downtown is not to be confused with the Old Town/West Side City area located on the other side of the river and about one mile (1.6 km) south. Old Town houses many popular bars, locally owned restaurants, and arts organizations. The city's roster of local arts organizations includes Pit and Balcony, one of the oldest continuously operating community theaters in the United States, founded in 1932. The Saginaw Spirit play against the Plymouth Whalers at the Wendler Arena of the Dow Event Center during an Ontario Hockey League season-opening game in September 2005. The Saginaw area is home to two professional sports teams as well as one NCAA Division-II school that has various sports programs. The Saginaw Spirit is an Ontario Hockey League team that became nationally known when television personality Stephen Colbert promoted the team on his show, The Colbert Report. The Saginaw Sting is an indoor football team that formed in 2007 to play in Saginaw beginning in the 2008 season. At the collegiate level, Saginaw Valley State University competes in numerous sports such as American Football, Basketball, and Volleyball. Saginaw's Bliss Park, pictured here in July 2010. The Castle Museum of Saginaw County History is arguably the most important and prominent museum in Saginaw. The museum is housed in a former post office which was built to resemble a castle, and pays homage to the historical French heritage of the area. With over 100,000 artifacts in their collection, the Historical Society of Saginaw County displays items from their collection as well as that of traveling exhibits. The Andersen Enrichment Center and Lucille E. Andersen Memorial Rose Garden are part of the Saginaw's park system. These locations are used to host private and public events throughout the year. Past events have included, Hollyday Art Fair  and a World AIDS Day service The garden includes a fountain with a sculpture by Marshall Fredericks. The Saginaw Art Museum hosts temporary exhibitions and permanent collections. The museum also houses The John and Michele Bueker Research Library and Archives of Michigan Art. The museum originated as the home of C.L. Ring who commissioned Charles A. Platt to design the house and gardens. The museum opened to the public in 1948. The museum is a Smithsonian Institution affiliate. Saginaw is home to a Japanese Cultural Center, Tea House and Garden, as a result of its 52 year Sister-City relationship with Tokushima, Japan. The Garden was completed in 1971. The Tea House,known as Saginaw Awa An, completed in 1986, is considered to be one of the ten most authentic Tea Houses outside the country of Japan. The site is open from April through October, and offers traditional tea ceremonies by appointment, and on the second Saturday of each month. Each year in September a Japan Festival is held in the garden, featuring authentic Japanese singers, dancers and performers, and offering demonstrations of Japanese Culture to those in attendance, including flower arranging, calligraphy, origami, and authentic Japanese cuisine,such as sushi and other dishes. The city is also home to the Theodore Roethke Home Museum, a National Literary Landmark. The museum honors one of America's greatest 20th Century poets, who was born and raised in Saginaw. Saginaw is part of Nielsen's Flint-Saginaw-Bay City-Midland Designated Market Area which is the 66th largest market in the United States for Television Viewers. Saginaw is the home of CBS affiliate WNEM which maintains its studios and offices inside the City though its license is for Bay City, MI. ABC affiliate WJRT maintains its offices and newsrooms in Saginaw while its studios are in its community of license, Flint. Only NBC affiliate WEYI and Christian station WAQP have the City of Saginaw as their city of record but both maintain their facilities outside of the city. Charter Communications operates a cable television network servicing the City of Saginaw under a franchise agreement. Radio stations licensed within the immediate Saginaw area (Saginaw County) are listed. Many locations in the City of Saginaw also receive stations from Bay City, Midland, Flint, and Lansing. Saginaw is referred to in the Simon & Garfunkel song "America": "It took me four days to hitchhike from Saginaw, I've gone to look for America." Bill Anderson and Don Wayne wrote a song entitled "Saginaw, Michigan" that has been covered by a dozen artists. Cowboy singer Lefty Frizzell was the first to perform it, with his version reaching number one on the country charts. Also popularly, it was performed by Johnny Cash. The song mis-situates the city on Saginaw Bay, about 15 miles to the north. Saginaw was also referred to as "dreadful" by the bold character Miss Ferenczi in the short story "Gryphon" by Charles Baxter. Saginaw served as the destination point for the Seinfeld characters Kramer and Newman during an episode where the pair hatched a scheme to transport bottles and cans via a United States Postal Service mail truck from New York to Michigan to earn 10¢ per recycled item, as opposed to New York's 5¢. In an episode of the Disney Channel sitcom Even Stevens, the title family's patriarch Steven, played by Tom Virtue, declares that he is a native of Saginaw. In an episode of The CW Television Network's television series, Supernatural, brothers Sam and Dean investigate a murder meant to look like a suicide in Saginaw. ^ "USGS Detail on Saginaw, MI". http://geonames.usgs.gov/pls/gnispublic/f?p=gnispq:3:::NO::P3_FID:636498. Retrieved 2007-11-26. 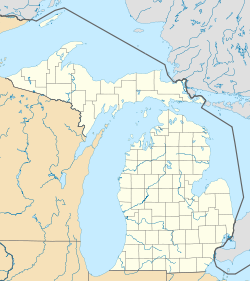 ^ "About Saginaw County, MI". National Association of Counties. Archived from the original on 2007-10-18. http://web.archive.org/web/20071018130025/http://naco.org/Template.cfm?Section=Find_a_County&Template=/cffiles/counties/county.cfm&id=26145. Retrieved 2007-11-26. ^ "A Brief History of Lumbering in Michigan". Michigan Center for History Studies. http://www.michigan-history.org/lumbering/LumberingBriefHistory.html. Retrieved 2007-11-27. ^ Michigan Counties. DNR. Retrieved 2012-11-05. ^ Leeson, Michael A. (2005) . History of Saginaw county, Michigan. Ann Arbor, Mich.: University of Michigan Library. pp. 596+. http://name.umdl.umich.edu/bad1164.0001.001. Retrieved 2007-04-11. ^ "Minutes of City Council Meeting - June 27, 2005". http://www.saginaw-mi.com/Government/Departments/CityCouncil/Minutes/2005/06-27-05%20Council%20Meeting-NA.doc. Retrieved 2007-11-29. ^ a b "City Charter Preface". http://www.saginaw-mi.com/Government/charter/preface.php. Retrieved 2007-11-29. ^ Thompson, Mike (June 2007). "Saginaw Celebrates its 150th Birthday!". Review Magazine 29 (641). Retrieved on 2007-11-29. ^ "Saginaw Steering Division - Generations of GM". http://history.gmheritagecenter.com/wiki/index.php/Saginaw_Steering_Division. Retrieved 2012-06-23. ^ a b White, Joseph B. (11 February 2012). "In the Heart of the Rust Belt, Chinese Funds Provide the Grease". The Wall Street Journal. http://online.wsj.com/article/SB10001424052970203735304577163741272699930.html. Retrieved 13 May 2013. ^ a b "GM TO CLOSE FOUNDRY IN MICHIGAN, CUT MOST JOBS AT NEW YORK FOUNDRY PRECEDE SAGINAW". Associated Press. 6 August 1986. http://www.apnewsarchive.com/1986/GM-To-Close-Foundry-In-Michigan-Cut-Most-Jobs-at-New-York-Foundry-Precede-SAGINAW/id-480e1222868a203b7fe39fae8445e3c3#. Retrieved 12 May 2013. ^ a b "About Us". Thomson Aerospace and Defense. http://www.thomsonaerospace.com/about-us/. Retrieved 13 May 2013. ^ Lynch-Morin, Kathryn (18 May 2010). "Trust fund to pay for cleaning old GM sites, including Saginaw". The Saginaw News. http://www.mlive.com/business/mid-michigan/index.ssf/2010/05/trust_fund_to_pay_for_cleaning.html. Retrieved 13 May 2013. ^ a b Bowman, Bill. "Central Foundry Division". GM Heritage Center. http://history.gmheritagecenter.com/wiki/index.php/Central_Foundry_Division. Retrieved 12 May 2013. ^ Engel, Justin (24 January 2010). "Leaders ponder Saginaw Malleable foundry's fate". The Saginaw News. http://www.mlive.com/news/saginaw/index.ssf/2010/01/leaders_ponder_saginaw_malleab.html. Retrieved 12 May 2013. ^ a b McFarland, Jodi (1 June 2009). "Saginaw Metal Castings Operations timeline". The Saginaw News. http://www.mlive.com/business/mid-michigan/index.ssf/2009/06/saginaw_metal_castings_operati.html. Retrieved 12 May 2013. ^ "Our Location [sic"]. TRW Automotive Holdings. http://www.trw.com/AboutTRW/locations. Retrieved 13 May 2013. ^ Roesner, Joshua (26 December 2012). "Saginaw Steering Gear Plant 2 lives on as former employees gather more than a decade after factory razed". Saginaw News. http://www.mlive.com/news/saginaw/index.ssf/2012/12/saginaw_steering_gear_plant_2.html. Retrieved 12 May 2013. ^ Roush, Matt (30 April 2013). "Tech Tour Day Five: Tri-Cities Terrific". WWJ News 62. http://detroit.cbslocal.com/2013/04/30/tech-tour-day-five-tri-cities-terrific/. Retrieved 12 May 2013. ^ "Chevrolet Nodular Iron Casting Plant". (brochure, ca. 1976). Chevrolet Motor Division. http://www.gmheritagecenter.com/docs/gm-heritage-archive/historical-brochures/Chevrolet_History/Chev_Nodular_Iron_Casting_Plant.pdf. Retrieved 12 May 2013. ^ Rogers, Dave (22 April 2012). "Why Did U.S. Win WW II? Saginaw Gun Plant Personified Patriotic Production". MyBayCity.com. http://www.mybaycity.com/scripts/p3_v2/P3V3-0200.cfm?P3_NewspaperID=868&P3_articleID=6946. Retrieved 13 May 2013. ^ "A Pocket History of the M1 Carbine". http://www.fulton-armory.com/M1Carbine.htm. Retrieved 2007-11-29. ^ "The Midland Urban Growth Area (MUGA)". City of Midland Planning Department. http://www.midland-mi.org/government/departments/planning/planning/muga.htm. Retrieved 13 May 2013. ^ "Census 2010 News U.S. Census Bureau Releases Data on Population Distribution and Change in the U.S. Based on Analysis of 2010". http://2010.census.gov/news/releases/operations/cb11-cn124.html. Retrieved 23 June 2012. ^ a b Oosting, Jonathan. "Detroit, Flint and Saginaw get bulk of federal funds awarded to fight blight in 5 Michigan cities". Mlive.com. http://www.mlive.com/news/index.ssf/2013/08/detroit_to_get_bulk_of_federal.html. Retrieved 2014-01-01. ^ Tower, Mark. "Sell your run-down house in Saginaw for cash: Owners given chance to unload properties". Mlive.com. http://www.mlive.com/news/saginaw/index.ssf/2013/11/sell_your_run-down_house_for_c.html. Retrieved 2014-01-01. ^ Tower, Mark. "CBS Television executive confirms multimillion-dollar plans for historic block in downtown Saginaw". Mlive.com. http://www.mlive.com/news/saginaw/index.ssf/2013/09/cbs_television_executives_to_d.html. Retrieved 2014-01-01. ^ "Weatherbase: Historical Weather for Saginaw, Michigan, United States of America". http://www.weatherbase.com/weather/weather.php3?s=060457. Retrieved November 26, 2007. ^ United States Census Bureau. "Census of Population and Housing". http://www.census.gov/prod/www/decennial.html. Retrieved July 9, 2013. ^ "Annual Estimates of the Resident Population: April 1, 2010 to July 1, 2012". http://www.census.gov/popest/data/cities/totals/2012/SUB-EST2012-3.html. Retrieved July 9, 2013. ^ Combined Statistical Areas and Component Core Based Statistical Areas, Office of Management and Budget, 2007-05-11. Accessed 2012-09-25. ^ a b AHA Guide to the Health Care Field. American Hospital Association. 2013. ISBN 9780872589063. ^ "Our Schools". http://www.spsd.net/ourschools/schools.htm. Retrieved 2013-01-17. ^ a b "Saginaw 2001 Water Report" (PDF). http://www.saginaw-mi.com/Government/Departments/PublicServices/waterReport2001.pdf. Retrieved 2007-11-27. ^ a b "Planning & Community Development". http://www.midland-mi.org/government/departments/planning/Planning/muga.htm. Retrieved 2007-11-27. ^ a b Devereaux, Brad. "In Saginaw's most dangerous neighborhood, 'a lot of these kids don't have any hope,' police chief says". Mlive.com. http://www.mlive.com/news/saginaw/index.ssf/2013/10/in_saginaws_most_dangerous_nei.html. Retrieved 2014-01-01. ^ Engel, Justin. "STARS tax rides to victory". The Saginaw News. http://blog.mlive.com/saginawnews/2007/11/stars_tax_rides_to_victory.html. Retrieved 2007-11-26. ^ Sunaya Sapurji (2007-02-01). "The Steagle has landed". Toronto Star. http://www.thestar.com/article/177061. Retrieved 2007-11-26. ^ "Saginaw feels the Sting". WEYI-TV. http://www.weyi.com/sports/sports_story.aspx?id=63899. Retrieved 2007-11-26. ^ "Athletics home". http://www.svsu.edu/athletics/home.html. Retrieved 2007-11-26. ^ "Hollyday Art Fair at the Anderson Enrichment Center". http://www.mlive.com/entertainment/saginaw/index.ssf/2009/12/post_2.html. Retrieved 2009-12-14. ^ "World Aids Day event is Tuesday". Mlive.com. http://www.mlive.com/living/bay-city/index.ssf/2009/11/world_aids_day_event_is_tuesda.html. Retrieved 2009-12-14. ^ "Smithsonian Affiliations". http://affiliations.si.edu/AffiliateDetail.Asp?AffiliateID=181. Retrieved 2009-12-24. ^ "Sampling the Population". http://www.nielsenmedia.com/nc/nmr_static/docs/2007-2008_DMA_Ranks.xls. Retrieved 2007-11-26. ^ "Station Details - WNEM". http://fjallfoss.fcc.gov/cgi-bin/ws.exe/prod/cdbs/pubacc/prod/sta_det.pl?Facility_id=41221. Retrieved 2007-11-27. ^ "Station Details - WJRT". http://fjallfoss.fcc.gov/cgi-bin/ws.exe/prod/cdbs/pubacc/prod/sta_det.pl?Facility_id=21735. Retrieved 2007-11-27. ^ "Station Details - WEYI". http://fjallfoss.fcc.gov/cgi-bin/ws.exe/prod/cdbs/pubacc/prod/sta_det.pl?Facility_id=72052. Retrieved 2007-11-27. ^ "Station Details - WAQP". http://fjallfoss.fcc.gov/cgi-bin/ws.exe/prod/cdbs/pubacc/prod/sta_det.pl?Facility_id=67792. Retrieved 2007-11-27. ^ "Simon and Garfunkel "America" lyrics". http://www.songfacts.com/detail.php?id=3323. Retrieved 2008-02-13. ^ Second Hand songs, origins and covers of "Saginaw Michigan". ^ "Left Frizzell, Saginaw Michigan lyrics.". http://www.thelyricarchive.com/song/89665-11151/Saginaw%2C-Michigan. Retrieved 2008-02-13. ^ Youtube, Lefty Frizzell performing "Saginaw Michigan. This page uses content from the English language Wikipedia. The original content was at Saginaw, Michigan. The list of authors can be seen in the page history. As with this Familypedia wiki, the content of Wikipedia is available under the Creative Commons License.